The beauty of MovNat is that you can practice anywhere. You don’t need an expensive gym membership or access to nature. Although, these can be wonderful assets. You also don’t need a lot of bulky or expensive equipment. Although, some purposeful equipment can be very helpful. Many have learned that MovNat not only travels well, it’s also the perfect home exercise system. There is so much you can do in your home, whether you have a studio apartment in the city, a house in the country, or anything in between. Even if all you have is some floor space and perhaps an odd object or two, you can do a lot of MovNat. This article will give you some ideas for how to outfit a home gym that will open up countless training options. 1) Start with a designated space. Although this is not necessary, the best case scenario is that you have a designated place in or around your home where you’ll do your MovNat training. This can be a shared or dual-purpose space such as your living room floor. But preferably, you’ll have one spot tucked away somewhere that is used exclusively for your training. Ideally, the space you choose will always be ready and waiting for you, will require no preparation or tidying up prior to training, and will contain minimal distractions (e.g. away from the TV, bills, to-do list, etc.). If no space comes to mind, think outside the box. Maybe you’ve got a corner in your garage, barn, basement, porch, or your yard that could be used. Even small spaces can provide many options. A good rule of thumb is that if you’ve got enough room to lay down, you’ve got enough room to MovNat. Of course, the more space, the better. Once you’ve got a space selected, do what you can to make it convenient and comfortable to train there (although, not too comfortable!). Clean it up. Install gym flooring or keep a MovNat mat rolled up nearby. Whatever feels right to you, make it feel like your own personal oasis for training. Once you’ve got a designated space, you’ll be able to determine how much equipment you can fit there. And keep in mind that just having some floor space is enough to do a whole lot of natural movement training! MovNat offers a myriad of ground movements you can perform with nothing but your own body and the ground beneath you. You can also jump, crawl, roll, and move in many other ways, too. 2) Add a few versatile and portable training tools. In the beginning, you’ll want to invest in tools that are versatile and multi-purpose. And if you’re limited on space, you’ll want those tools to be as compact as possible. Sure, having a whole climbing wall and ropes course would be great. And if you’ve got the space and budget for it, all the power to you. But at first, most of us would be best served by something like a medicine ball or a sandbag. Or, even a rock or two, for those who prefer a more natural and less expensive option. All of these can be lifted, carried, thrown, and caught, in hundreds of different ways. And they take up very little space – making them ideal for home training. 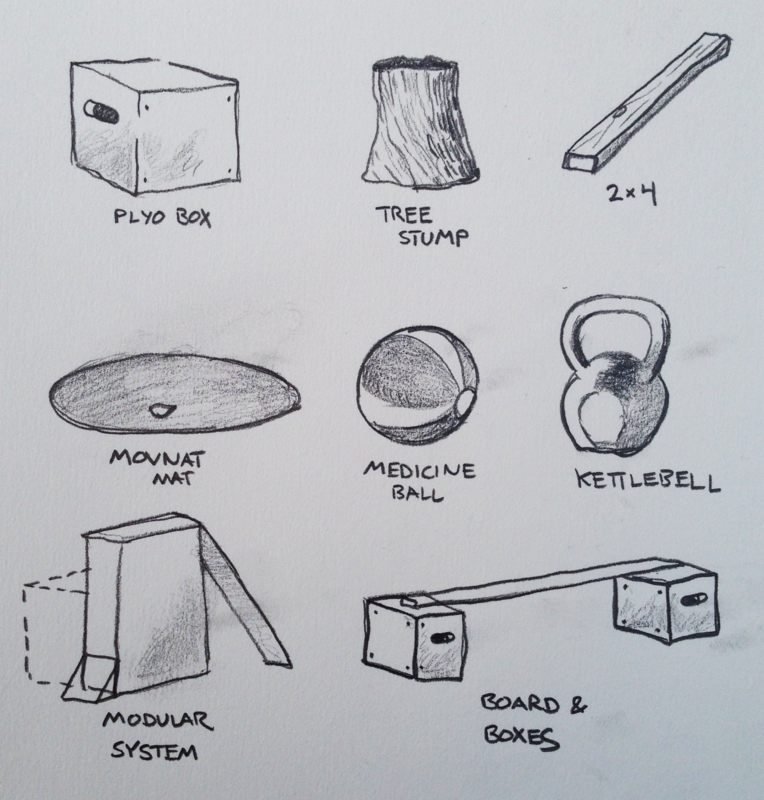 Here are a few MovNat-friendly equipment ideas that fit this “versatile and compact” criteria. Medicine Ball(s) – An excellent, multi-purpose tool for the manipulative natural movement skills (i.e. lifting, carrying, throwing, catching). You can use a medicine ball for a variety of throwing and catching movements, to add weight to ground movements, and for the many lifting and carrying exercises, too. They come in many different weights and sizes. If you live in an apartment building, get a soft one to minimize noise. Sandbag(s) – These excel in the lifting and carrying department, but can also be used for throwing and catching. There are many fitness-oriented training sandbags available these days. They can be as heavy or as light as you want, and some models make it easy to adjust the weight. Of course, you could make your own, to save money. But if you want to minimize the risk of making a mess, get a professional quality sandbag from a reputable company. Kettlebell(s) – Like the tools listed above, kettlebells are a great tool for the manipulative natural movement skills. They come in a variety of different weights and take up very little space. Pull-up Bar – If you don’t have a place where you can “hang out” around your home, a pull-up bar makes a lot of sense. They are a great tool for the many hanging exercises and climbing progressions. There are many different kinds available, each with their unique advantages. For maximum versatility, get a pull-up bar that is either mounted into the studs or joists of your home or a freestanding bar that is anchored to the ground. Otherwise, a door frame pull-up bar, while not as secure, will still work for some of the more basic movements and exercises. 2×4 Board – A simple piece of lumber is a perfect rudimentary balance training tool, and can be used in conjunction with some of the tools above (e.g. weighted carry with a sandbag while balancing on a 2×4 board). If you don’t already have one laying around your home, you can pick one up at any hardware store for a few bucks. Find one that’s really warped for a little extra challenge. If you outfit your home gym with a few of the tools above, and add in a little floor space, you’ll have an endless variety of movement options at your fingertips. As you can see, the equipment above would take up very little space and still provide a lot of different training possibilities. After you’ve got a few versatile training tools, you may eventually want to expand your collection as space and funds allow. Maybe you’d like to improve a specific skill-set, like jumping or balancing. Or, perhaps you’ve always thought it would be fun to have a climbing rope. Whatever the reason, start filling in those gaps after you’ve got the basics covered. While the fitness industry has led us to believe that we need all kinds of different gadgets and gizmos to get fit and healthy, you really don’t need that much to practice natural movement, especially when you’re just getting started. Now, there are also many things you can repurpose for natural movement training. For those on a budget, for instance, you can do a lot with a few rocks or logs. These can be lifted, carried, thrown, or caught. They can also add extra load for many different movements (e.g. ground movements and balancing, etc.). And you can jump on them, too. And don’t forget that many second-hand items from yard sales or the classified ads are often available at low prices as well. As you can see, you’re only limited by your imagination! It’s also helpful to think of your home as not only what’s inside your house or apartment, but what’s around it, too. Perhaps you have a back yard where you can crawl, a stairwell where you can practice jumping, a fence you can vault, a tree where you can climb, or a local park or playground that provides tons of options. Sometimes, looking at your habitat with an eye for movement can reveal all kinds of activities you can practice close to home. And we guarantee that after you’ve been doing MovNat for awhile, you’ll start to see your environment in a totally different way. Movement opportunities are everywhere when you know what to look for. If you’d like some examples of a MovNat home gym or training space, check out this story: MovNat at Home (Case Study). And if you have a MovNat home gym or space you’d like to show off, please send us a photo so we can share it with the tribe. Is it versatile (i.e. multi-purpose)? Is it compact (i.e. takes up minimal space)? Is it fun to use or otherwise interesting to you? Will it help you reach a specific goal you have? Whatever you decide to do, have some fun with this. Be creative. It’s your space and your movement practice. Make it your own. If you’d like more ideas for training MovNat at home, sign up for the MovNat newsletter. What other equipment do you use to MovNat?